Since 1985, Ontario Investments has provided the kind of adaptable, individualized service that only a small leasing company can offer. Ontario has specialized in designing custom operating leases of equipment from the largest manufacturers in the business for a range of municipal clients, from state and local governments and public schools, to hospitals and police departments. At Ontario Investments, the collective experience behind our product is our greatest strength—and your biggest advantage. While Ontario Investments prides itself on tailor-made products, the reason for the company’s success lies equally in the people who stand behind the product. President and owner Jim Marsallo Sr. says 43 years of combined leasing industry experience goes a long way toward convincing clients that they’re dealing with a company that knows its business. Ontario Investments is better able to adjust to industry changes—an advantage for its customers. 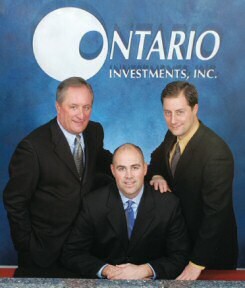 Ontario Investments’ employee sale programs at the end of the lease period are also unique to the industry. “It’s another example of an advantage we offer that our competitors can’t match,” says Jim Jr. “These sales represent a real benefit to employees, while allowing employers to replace their old equipment without having to dispose of it.” Efficiency & Attention “Streamlined, truly personalized service is what makes us different,” says Michael Marsallo, Vice President/Treasurer. “We work together to create the ideal leasing package for any customer in a short period of time, without committees or lengthy meetings.” And since all three Marsallos are under the same roof, there’s no separate finance, contract, and invoicing departments.